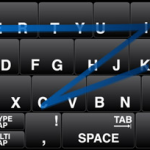 Here is an innovative way to input text on touchscreens. The guys who brought us T9, the predictive text input method now on most mobile phones, have now come up with a new way of entering words without lifting the finger or stylus off the screen. The computer will guess which word we are trying to type. I look forward to trying it out on the iPhone when it is released.